Over the last half-year, Google has quietly acquired eight technology companies in an effort to create a new generation of robots. This latest acquisition, Boston Dynamics builds robots mostly for the Department of Defense, namely DARPA. Google owns over 100 companies including such prominent companies as You-Tube, Android, Chrome and Motorola to name just a few. Let me just get it out: Is Google, up to something nefarious? If we piece some parts of the Google puzzle together, I think we can see some frightening implications, namely that Google's framework is an Orwellian nightmare about controlling American's, our actions, and our thoughts... while they happen to be closely tied with the Barack Obama Administration. Their plans seem to be taking us on a long term collision course, helping to set the stage with the book of Revelation's anti-christ system. I am not suggesting this is intentional, nor am I suggesting it is not. I certainly am not suggesting that they haven't done good or that the vast majority of its employees are not decent, smart and hard working people. I am suggesting that there are things that we should take note of, and things that should set off a proverbial "red flag" in our minds. Not all things "Google" are necessarily good. Google Spies for the NSA - Of course, they aren't alone, because we can throw in there Yahoo, Facebook and others. Nevertheless, they are in fact spying on the American people by either turning over information, or allowing the NSA to use their servers to spy on Americans like it or not. Yes, they lay all the blame on the NSA. The fact that they are cozy with Obama, even to the point of working on his campaign, doesn't in my view, exude a sense of separation from the government. If they were truly upset about the NSA using them to spy on American's, why did they not speak out before it came up? Why would they still be so supportive of Barack Obama? Google got intimate with the the Department of Defenses, "DARPA" and hired "Regina E. Dugan -- former Director of DARPA and current executive at Google [who] describes with excitement the coming BEAST TECH smart tattoos and ingestible biochips that are ALREADY FDA APPROVED and that people will want to receive (and then be REQUIRED to receive) by 2017. She glows about the "super powers" the MARK will give her and says today's generation wants them too." In light of Google's preoccupation with invading your brain, and its intimate relationship with the Obama White House,(keep reading) is it then a coincidence that Obama, in 2013, introduced his "Brain Initiative" with its intent on "mapping" our brains? Almost anything that’s already in the Google ecosystem: calendar appointments, location data, search preferences, contacts, personal habits based on Gmail chatter, device information and search queries, to name a few." During the 2012 campaign, Barack Obama’s reelection team had an underappreciated asset: Google’s (GOOG)executive chairman, Eric Schmidt. He helped recruit talent, choose technology, and coach the campaign manager, Jim Messina, on the finer points of leading a large organization. “On election night he was in our boiler room in Chicago,” says David Plouffe, then a senior White House adviser…"
Google hides Obama's Social Security Number story- Google queries about discretion in Obama's Social Security Number brought back results that had nothing to do with the queried question. Coincidence? You tell me. When asked about it, Google told WND, that they were "looking into it". Obama and Google (A love story)- "What we shared is a belief in changing the world from the bottom up, not from the top down," Obama told Google employees during a 2007 visit to its headquarters in Mountain View, Calif."
Google Honors Cesar Chavez on Easter- "Google has been known for dissing the Founder’s birthdays and American history in favor of Marxist ideals and Islamic tradition. This time, they really let their mask fall." CENSORING CHRISTIANS: FACEBOOK, GOOGLE, MYSPACE, APPLE- "These platforms could well be the platforms for anti religious censors of our day"
All hail the GoogleBots: Here’s a look at the 7 robot companies Google just acquired -"But the companies all point to Google’s final goal here: to create a smart, mobile, dexterous robot that can work alongside — or in place of — humans." SAN FRANCISCO — BigDog, Cheetah, WildCat and Atlas have joined Google’s growing robot menagerie. Google confirmed on Friday that it had completed the acquisition of Boston Dynamics, an engineering company that has designed mobile research robots for the Pentagon. The company, based in Waltham, Mass., has gained an international reputation for machines that walk with an uncanny sense of balance and even — cheetahlike — run faster than the fastest humans. It is the eighth robotics company that Google has acquired in the last half-year. Executives at the Internet giant are circumspect about what exactly they plan to do with their robot collection. But Boston Dynamics and its animal kingdom-themed machines bring significant cachet to Google’s robotic efforts, which are being led by Andy Rubin, the Google executive who spearheaded the development of Android, the world’s most widely used smartphone software. Boston Dynamics was founded in 1992 by Marc Raibert, a former professor at the Massachusetts Institute of Technology. It has not sold robots commercially, but has pushed the limits of mobile and off-road robotics technology, mostly for Pentagon clients like the Defense Advanced Research Projects Agency, or Darpa. Early on, the company also did consulting work for Sony on consumer robots like the Aibo robotic dog. Boston Dynamics’ walking robots have a reputation for being extraordinarily agile, able to walk over rough terrain and handle surfaces that in some cases are challenging even for humans. A video of one of its robots named BigDog shows a noisy, gas-powered, four-legged, walking robot that climbs hills, travels through snow, skitters precariously on ice and even manages to stay upright in response to a well-placed human kick. BigDog development started in 2003 in partnership with the British robot maker Foster-Miller, NASA’s Jet Propulsion Laboratory and Harvard. The video has been viewed more than 15 million times since it was posted on YouTube in 2008. More recently, Boston Dynamics distributed a video of a four-legged robot named WildCat, galloping in high-speed circles in a parking lot. Although the videos frequently inspire comments that the robots will evolve into scary killing machines straight out of the “Terminator” movies, Dr. Raibert has said in the past that he does not consider his company to be a military contractor — it is merely trying to advance robotics technology. Google executives said the company would honor existing military contracts, but that it did not plan to move toward becoming a military contractor on its own. 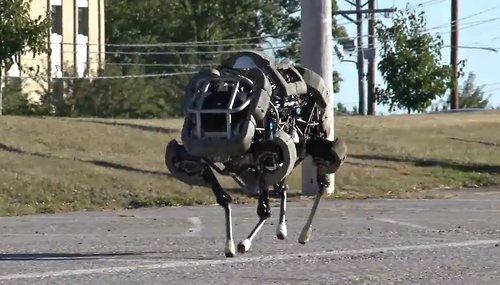 Under a $10.8 million contract, Boston Dynamics is currently supplying Darpa with a set of humanoid robots named Atlas to participate in the Darpa Robotics Challenge, a two-year contest with a $2 million prize. The contest’s goal is creating a class of robots that can operate in natural disasters and catastrophes like the nuclear power plant meltdown in Fukushima, Japan. “Competitions like the Darpa Robotics Challenge stretch participants to try to solve problems that matter and we hope to learn from the teams’ insights around disaster relief,” Mr. Rubin said in a statement released by Google. A recent video shows a robot named Cheetah running on a treadmill. This year, the robot was clocked running 29 miles per hour, surpassing the previous legged robot land speed record of 13.1 m.p.h., set in 1999. That’s about one mile per hour faster than Jamaica’s Usain Bolt, the two-time Olympic gold medalist in the 100-meter dash. But it’s far short of a real cheetah, which can hit 65 m.p.h. Google’s other robotics acquisitions include companies in the United States and Japan that have pioneered a range of technologies including software for advanced robot arms, grasping technology and computer vision. Mr. Rubin has also said that he is interested in advancing sensor technology. Mr. Rubin has called his robotics effort a “moonshot,” but has declined to describe specific products that might come from the project. He has, however, also said that he does not expect initial product development to go on for years, indicating that Google commercial robots of some nature could be available in the next several years. Google declined to say how much it paid for its newest robotics acquisition and said that it did not plan to release financial information on any of the other companies it has recently bought. Dr. Raibert is known as the father of walking robots in the United States. He originally created the Leg Lab, a research laboratory to explore walking machines at Carnegie Mellon University in 1980. He then moved the laboratory to M.I.T. before leaving academia to build engineering systems for the military and Sony. His research in walking robots began with a pogo-stick project called “the hopper,” which he used to test basic concepts.